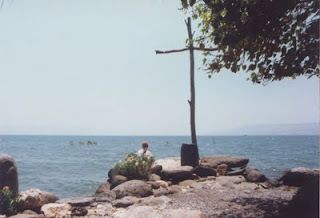 One Saturday, Christiane & Margit (two of the overseas nurses) and I headed to Lake Tiberias, to Dalmanutha, close to Capernaum. Very peaceful, just by the lake. 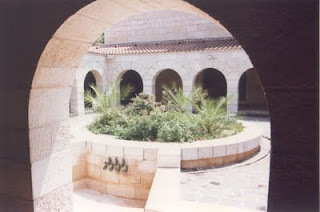 There was a church there, at Tabgha, supposedly built on the site of the miracle of the loaves and fishes. Some beautiful ancient mosaics inside. We spent some time sitting by the shore and watching the lizards scuttle back and forward across the path – some of them were quite large, much larger than the geckos which seemed very common. Well, we had a great day, and I abandoned the girls to do some exploring of my own. Eventually I had to get back to Nazareth. Basically I just started walking in the hope that I could hitch a ride along the way. Because of the heat, I figured that a pair of hiking sandals would do the trick, but the pair that I had picked up in the Nazareth Suq soon started creating serious problems. Not one of my better purchases. At a reasonable pace, however, I set out vaguely in the direction of Nazareth. Before too long, a van containing a bunch of Israeli students stopped and let me climb into the back. They were heading from the coast after some swimming, so I bounced around in the back among their gear. 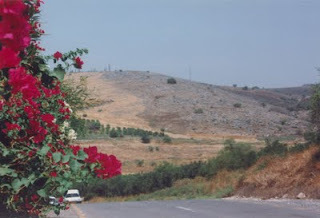 They dropped me off at a crossroads – Nazareth was on the left, and they were heading to Afulah. Unfortunately, Nazareth was still several miles away, and quite a walk in the hot sun. After walking for a couple of miles, and hitching with the standard thumb sign, I wondered why no-one stopped, even though they were driving by with otherwise empty cars. I found out later that the hitch-hiker's thumb gesture is considered rather rude in the vicinity. Eventually, as my water supplies were dwindling (and I can't have been much more than a couple of miles from Nazareth), a sherrut taxi with containing three middle-aged female Arab passengers stopped, and I gratefully hopped aboard. For a mere couple of Shekels, the driver dropped me back at the hospital. The sandals were binned. So how's the training going?